We as Hebrew women giving birth before we travail must produce fitting keys that will open Biafra doors. This time, it is for us to inwardly search our hearts, count our losses and get hold of our potentials as viable tools in this present struggle of our time. Our husbands, children and fathers are daily murdered and our plight not considered, as atrocities are launched into our lives. For how long will our eyes view these abominable acts and condone the sacrilege besetting our families and communities? This must not be so! Arise! 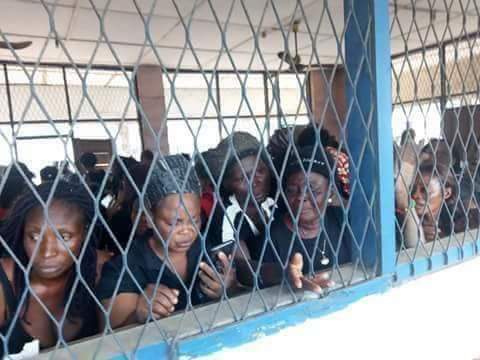 Biafran women, the time has come to rise to the occasion. We are no cowards! A mother's curse is potent poison with enough destructive venom to an accursed leadership, failed state and blood suckling political leaders. Our silence has become unacceptable as we must realize that the lioness never abandons her duty to fend for her family. Adam has Eve because alone, he was incomplete. Hey! Biafran women, it is time for the war cries and as wounded lionesses, we must rise to the occasion! It is time we accosted our cowardly eastern leaders who were born of women with tears, nakedness and curses! We have to purposely set into the Centre stage with claws that must pull down these gamut devouring our youths, fathers, husbands and land. It is time to awaken the night bird to cry it's cry of death, destruction and doom to these vampires who sacrifice their own and sell their birthright for token posts and small bites from wicked Fulani leaders whose only aim is to terminate us and possess our lands. These compromised leaders must be taught the power of womanhood, just like biblical Abigail ( 1 Sam 25: 3, 14,, 18, 23, 36, 39_42) Esther, ( Esther2:7; 4: 13_16,; 5: 1_2), Jael, (Judges 4:17_22). We must take our fate, future and that of our children in our hands. Doing the needful comes with a price, changing the trend that will cleanse our land and revoke damnation is costly and risky, but what are these compared to? For all concerned mothers, wives, grannies, women who must right the wrongs that have persisted for so long, it is high time we stop crying and hurting in silence. We must end the silence and refuse to be raped into oblivion, infertility and dumbness.